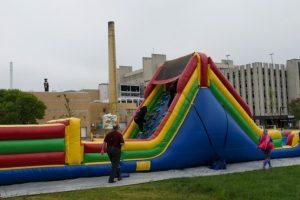 On a gloomy Monday, Regenstrief faculty and staff shone brightly as they celebrated another good year in the books with a cookout and some cross-center fun. 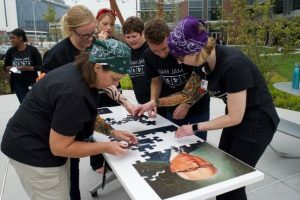 The inaugural Sam Jam event, held October 9 and lovingly named after our founder, Sam Regenstrief, featured an obstacle course featuring mental and physical challenges, and of course plenty of food to fuel the friendly competition. 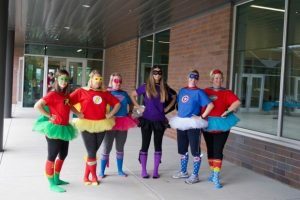 Gathered as teammates from each center and donned in workout gear and creative costumes, the groups enthusiastically took to our southern courtyard at the end-of-summer event designed to bring the entire institute together and encourage staff/faculty to get to know one another. 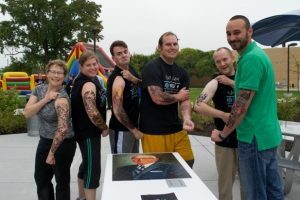 For the past several years, Regenstrief has participated in the J.P. Morgan Corporate Challenge. This year, the Wellness Committee brought the event in-house. Or, near-house, at least. The intention was to build a stronger community within our organization, and it truly did. Thank you to Jasmine Forrester and her team for putting together another great cookout and to Cynthia Lim Louis and her team for putting together such a great event. The excitement is building for next year’s Jam! 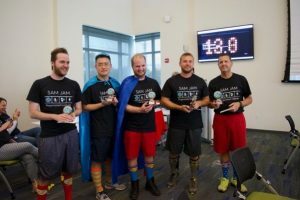 “AdMen” from Admin for best completion time!